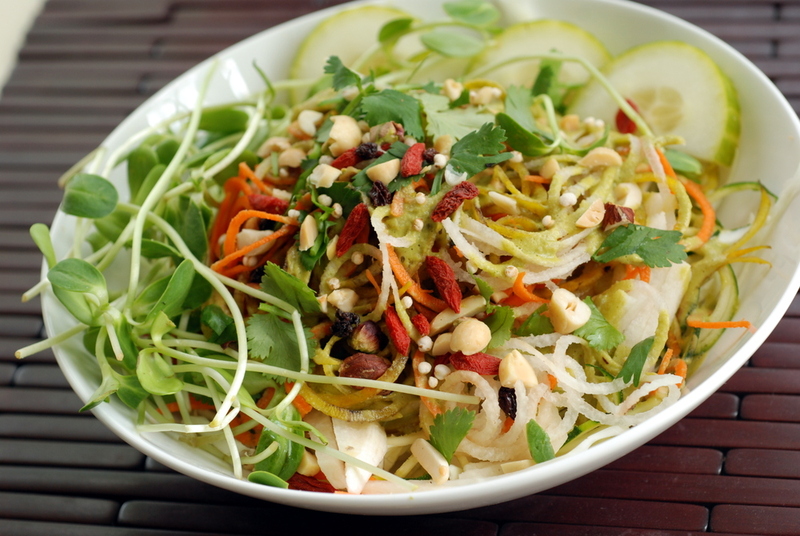 And while this noodle salad appears to be summer inspired, it is composed with plenty of root veggies available year round. Beets, carrots and jicama (if you can find it) along with crispy cucumbers. I also added zucchini, my favourite vegetable to turn into a noodle. The recipe may seem familiar, at least it did to me, reminiscent of the Tangled Thai Salad from Toronto’s chain of Fresh restaurants. The dressing is a bit different but still peanut-lime at its core. I embellished the salad with elements from Fresh’s salad topper (puffed quinoa, goji berries, currants) more as an homage to the recipes roots, than out of necessity. The salad is fresh and vibrant and literally bursting with vegetables. 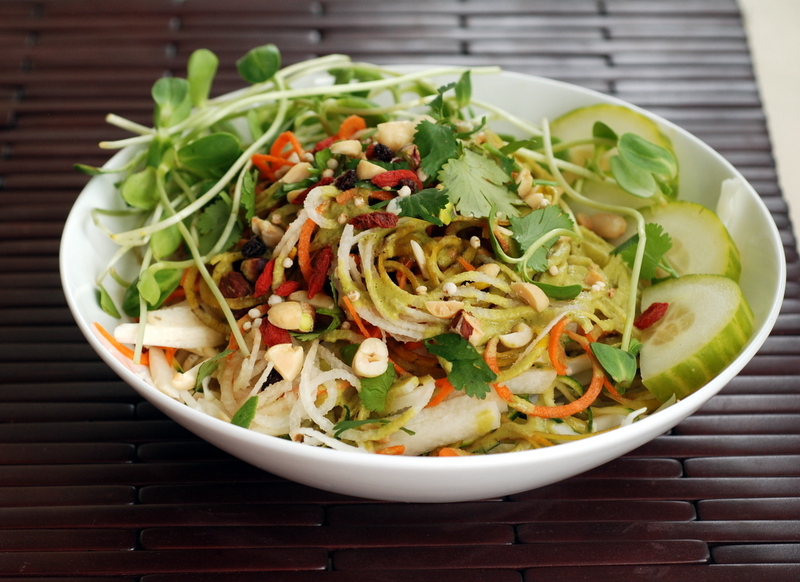 You will likely need extra dressing as your vegetables become such voluminous noodles. 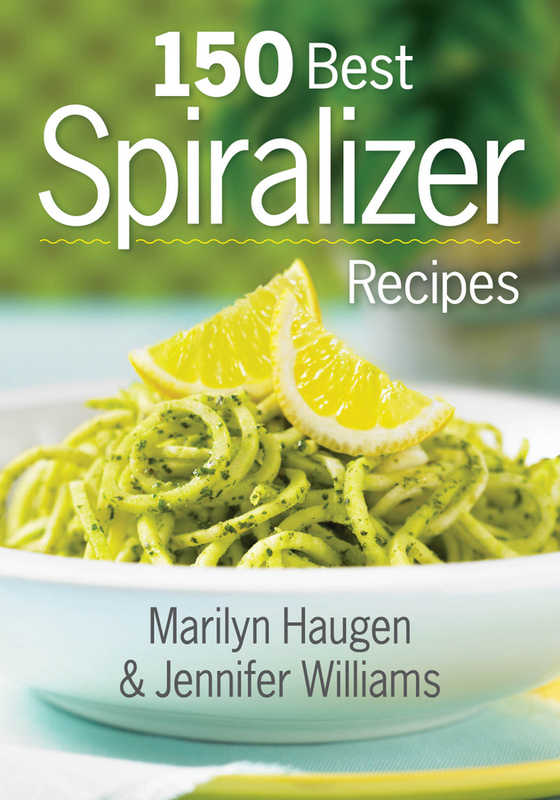 The recipes comes from 150 Best Spiralizer Recipes. While not a vegan cookbook, it is very vegan friendly. The recipes are broken down into gluten-free recipes, paleo recipes, vegan/vegetarian recipes and raw recipes. This means you can focus on a specific area, and ignore the rest that do not interest you. However, if you care to substitute your favourite plant-based protein (beans, tofu, etc), the paleo recipes would also be very accessible. Beyond salads, there are soups, main dishes and even desserts. 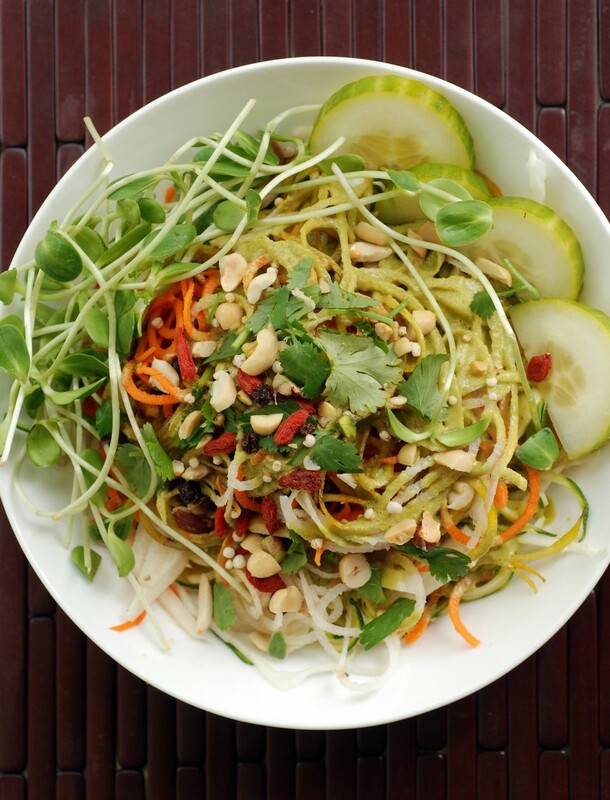 I can’t wait to try some of the recipes like Bountiful Thai Tofu with Peanut Sauce, Kung Pao Tofu and Zoodles, Kohlrabi Slaw, Lettuce Wraps with Pineapple, Curly Jicama and Water Chestnuts and Carrot Pasta with Coconut Lime Dressing. I also would like to veganize the Southern-Style Bourbon Chicken and Sweet Potatoes. I think chickpeas could work well. I like how the recipes suggest less common vegetables to be used in the spiralizer: turnip, plantain, butternut squash, kohlrabi and daikon while still including more common vegetables/fruits like apple, carrot, beet and zucchini. I look forward to becoming more creative in the kitchen. Thankfully, the publisher allowed me to giveaway the cookbook to a reader living in the US or Canada. To be entered in the random draw for the book, please leave a comment below telling me about your favourite fruit or vegetable to spiralize. How do you use it? The winner will be selected at random on October 14, 2015. Good luck! PS. I am sharing this with No Croutons Required, Vegetable Palette (for orange), Pasta Please for seasonal vegetables and Extra Veg. PPS. There is still time to enter the giveaway for Food52 Vegan. Author’s note: A bounty of vegetables is topped by a sassy peanut lime dressing that will awaken your taste buds. 1. Using a spiralizer, cut carrots, beets and jicama into thin strands. Pat jicama strands dry. Cut cucumber and cabbage into wide ribbons. Pat cucumber ribbons dry. Trim all strands and ribbons to 4-inch (10 cm) lengths. Toss together in a large serving bowl. 2. In food processor, combine garlic, 3 tbsp (45 mL) peanuts, peanut oil, peanut butter, honey, tamari, lime zest and lime juice; process until almost smooth and only a few chunks remain. 3. Drizzle dressing on top of salad. Garnish with cilantro and the remaining peanuts. 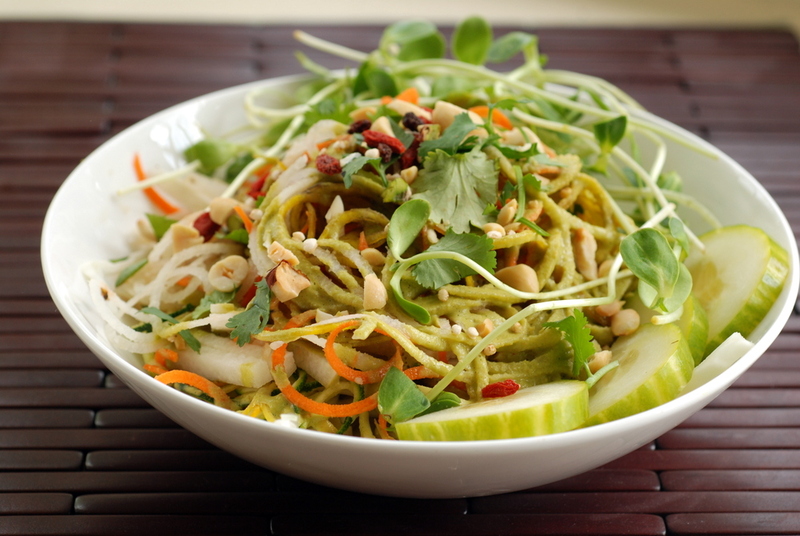 When spiralizing, you always end up with a little bit of vegetable or fruit that is too small to spiralize. I use these pieces to taste-test my dressing before adding it to the salad. The dressing doubles easily and can be stored in an airtight container in the refrigerator for up to 3 days. It’s delicious on a variety of salads or as a dipping sauce for tofu satay. My favorite veggie,although boring, is the zucchini because I love using pesto or marinara sauce for a quickie and easy supper.. I love spiralizing heirloom carrots because it can add such a vibrant splash of colour to dishes. Hi Barbara, Congratulations! You are the winner. Please check your email. My favorite is zucchini. I would love to make some tasty pasta with zucchini. I’eve never thought to spiralize jicama! Can’t wait to try that out. It’ still hot as hell here, so we are loving raw/cooling meals. Such neat ideas of veggies to elongate into palateable strings — squash sounds great. I think I’d try making zucchini noodles and toss them with pesto. 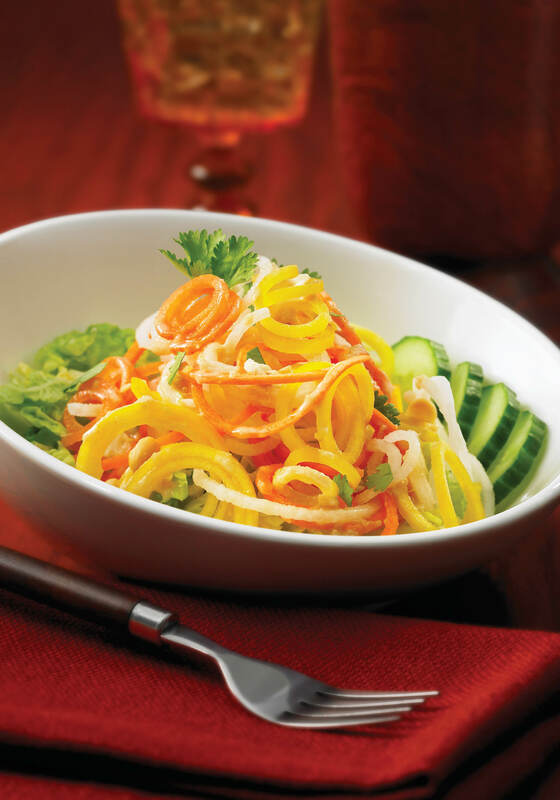 Although I really love carrot noodles with tomato sauce my family prefers spiralized cucumbers as salad. Thanks for this wonderful giveaway Janet. 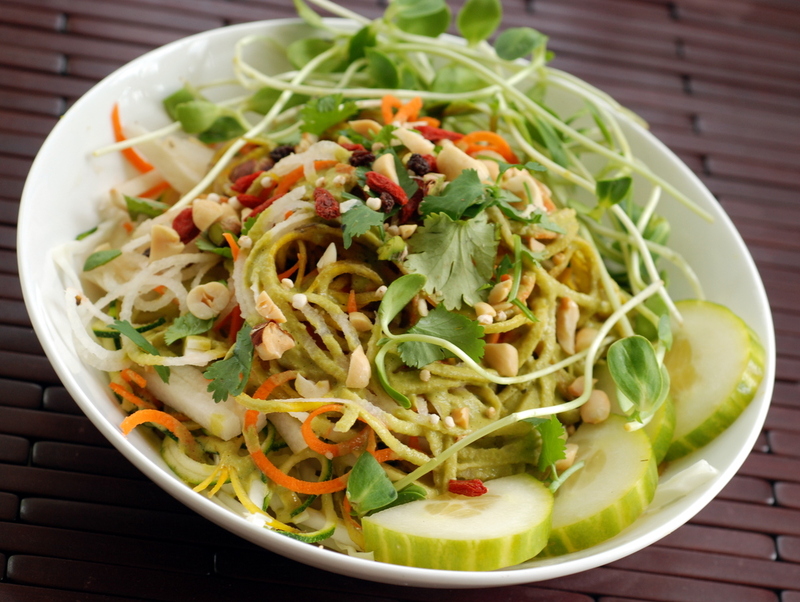 Zucchini is my favorite vegetable to spiralize. However, I really enjoy all kind of veggie, such as beetroots, carrots, sweet potatoes, buternut squash and daikon. I have only just got a spiralizer, certainly going to try this one with my last two courgettes! Eggplant and zucchini are awesome and easy for me to accomplish a delicious meal. I recently tried rutabaga and actually liked it.